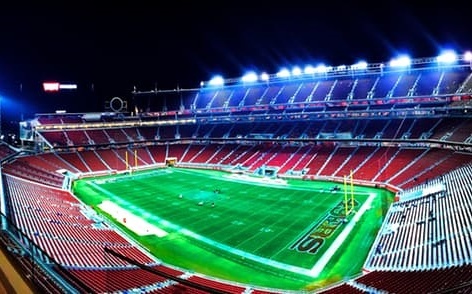 SANTA CLARA, Calif. (CN) – The city of Santa Clara is celebrating a legal victory against the San Francisco 49ers on Monday, touting the decision of an arbitrator to award the city an additional $10 million over the term of a 40-year lease. The Santa Clara Stadium Authority, a public body overseen by the City Council, was awarded an additional annual rent of about $262,000 by an arbitrator. The 49ers filed for arbitration after saying they should pay about $4.25 million less per year in annual rent due to the fact that the $1.3 billion construction project to build Levi’s Stadium came in under budget and ahead of schedule. Santa Clara and the 49ers have been embroiled in a long-standing dispute over several financial matters, including stadium rent, costs associated with providing public safety officials and how the city recovers what it spends on NFL games and other stadium events from the team. According to the terms of a measure approved by Santa Clara voters in 2010, the city agreed to shoulder the cost of constructing and owning the stadium, while the 49ers agreed to rent it from the city over 40 years. In March 2016, the 49ers reached out to the city regarding rent payments, saying the team was paying $24.5 million per year, when it should only have to pay about $20 million. The City Council unanimously voted to refuse the reduction and the matter soon went to arbitration, which was resolved late last week. Gillmor said the council will call on the 49ers to make documents related to the arbitration, which are typically kept confidential, public. “We hope the 49ers will work with us, not against us, and see that we can be good partners if the team will work cooperatively with the public,” Gillmor said. A close working relationship seems unlikely, however, as 49ers spokesman Rahul Chandok told San Jose Inside that Gillmor’s comments regarding the arbitration were misleading. The team has consistently criticized Gillmor and her decision to enlist an expensive public relations firm at taxpayer expense to fight the team in the court of public opinion. For her part, Gillmor has criticized the team for withholding documents necessary for a full public accounting. The two entities are also embroiled in a lawsuit in Santa Clara County Superior Court involving their long-standing contract dispute.